A total of 47 awards from 12 categories were presented to those who have contributed extensively to the development of the tourism industry in Malaysia at the 18th Malaysia Tourism Awards 2012/2013, held on 20 February at the Kuala Lumpur Convention Centre (KLCC). With the theme “Mystical Rainforest”, the prestigious event was officiated by the Minister of Tourism and Culture Malaysia Dato’ Seri Mohamed Nazri Abdul Aziz and attended by more than 1,000 guests. The Malaysia Tourism Awards is one of the highest recognitions bestowed by the Ministry of Tourism and Culture to individuals and organisations for tourism-trade related excellence and performance. The winners were selected through a stringent judging process comprising industry experts with immense experience and qualifications. This award accords recognition to tour operators registered with the Ministry of Tourism and Culture Malaysia that have the most outstanding record in selling and promoting Malaysia. This award accords recognition to foreign tour operators that have the most outstanding record in selling and promoting Malaysia in their respective markets. The award recognises the best tourism coverage and articles on Malaysia by local and foreign writers. Applicable to articles published in the year 2012/2013. This award recognises the best tourism magazine coverage on Malaysia by local and foreign magazines that have been published in the year 2012/2013. This award recognises hotels rated by the Ministry of Tourism and Culture Malaysia which offer quality and excellent service to their guests. This award recognises the best tourist attraction in Malaysia, whether man-made or natural, which has enhanced the country’s image as a tourist destination. This award is for the best tour programme offered by inbound tour operators registered in Malaysia. 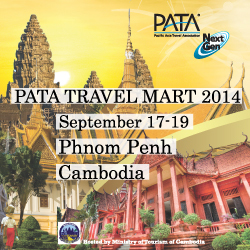 A tour operator may submit more than one tour programme under this category. This award recognises the best tourist guide. All tourist guides registered with the Ministry of Tourism and Culture Malaysia may submit their entries with a brief statement to support their entry. This award recognises shopping and retail outlets which fully support the efforts to make Malaysia an international shopping destination. This award recognises the best homestay which has successfully showcased Malaysian culture and lifestyle. It is open to all homestay registered with Ministry of Tourism and Culture Malaysia. This award recognises the best spa operators which fully support the efforts to make Malaysia an international spa destination. It is open to all spa operators registered and rated with the Ministry of Tourism and Culture Malaysia. This award recognises restaurants which contribute positively to Malaysia’s image as an attractive and clean “Gourmet Paradise”. First introduced in 1987 by the Ministry of Culture, Arts and Tourism, it was originally called the “Malaysia Tourism Gold Awards” but was renamed “Malaysia Tourism Awards” in 1993 to better reflect the distinction of the awards and the corporate image of Tourism Malaysia. This prestigious award is a tribute to those who have excelled and supported the development of tourism in Malaysia. It also acts as an incentive for participants to strive for the highest level of professionalism and quality in both products and service. The Malaysia Tourism Awards is the highest accolade for individuals and organisations, whose outstanding contributions play a significant role in the success of Malaysia’s tourism industry. It has expanded from a tourist-and-travel centric recognition programme into one that encompasses all service industries and where local patronage is equally relevant. It also honours industry players who break new boundaries to take risks in creating distinctive products and service that offer unique and memorable experiences of Malaysia. This event is held once every two years.